You never realized how little charm some classic animated dames were originally imbued with until you see them spring to life in a new series of hot pin-up retoolings by DC Comics artist Cliff Chiang, posted on the eve of the San Diego Comic-Con. 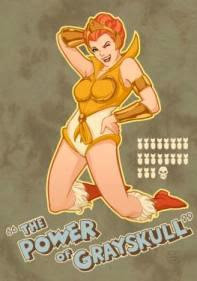 It's a treat to find oneself blindsided by the saucy devil-may-care demeanor of someone like Teela, the plain-Jane who formerly labored unglamorously in the shadow of glossier heroines such as fashionista megabitches She-Ra and the Sorceress. Cliff says others such as Black Canary, Zatanna, Wonder Woman, and Sue Storm are on the way.